Fire Creek has several glazes in our shop for you to choose from and we add more all of the time. A variety of glazes to compliment any tile installation or décor. We have samples available to help you pick the best glaze for your needs. Find all of our glaze colors here and we are always available to help you choose the best glaze for the tile you choose. A mid- brown glaze that can vary in shades of color. This glaze fires to a matte finish. A gray-taupe glaze that fires to a matte finish. A mid brown with red undertones. This glaze can vary with reds, warm yellow and sometimes grey depending on application and texture of the surface. This glaze fires to a matte finish. A translucent glaze that is a medium brown with a reddish tone. This glaze fires to a gloss finish. A soft tan-green glaze with dark brown specks. This glaze fires to a satin finish. A medium brown with red undertones. This glaze fires to a matte finish. A soft neutral cream that varies white to dark brown specks. This glaze fires to a gloss finish. A opaque white glaze with light taupe specks. This glaze fires to a matte finish. A soft creamy white glaze that varies to a darker cream. This glaze fires to a matte finish. A soft gray translucent glaze. This glaze fires to a satin finish. A translucent pure white glaze. This glaze fires to a gloss finish. A dark chocolatey brown undertone that has mid brown to rusty orange overtones. This glaze fires to a gloss finish. A dark chocolatey brown undertone with a soft taupe that floats on top. This glaze fires to a gloss finish. A translucent warm brown that breaks beautifully over relief and texture. This glaze fires to a gloss finish. A beautiful variegated glaze that ranges from black to taupe brown to flashes of red. This glaze fires to a gloss finish. This glaze changes depending on application. Varying from a olive green to a warm brown to a metallic brick red. If you are looking for texture and uniqueness, this is the glaze for you! A beautiful combination of creamy white to a soft yellow green. Fires to a satin finish. A matte glaze that varies from a taupe brown, brown to a turquoise blue and green. A beautiful olive green with a dark brown speck. A soft grayish green. A translucent glaze that fires to a gloss finish. A brilliant Spring green that fires to a satin finish. Breaks beautifully over high relief designs. A bluish green translucent glaze that fires to a gloss finish. A dark translucent green. A great glaze to highlight high relief tiles. This glaze fires to a gloss finish. A glossy glaze that varies from a dark green to a brighter mossy green. A very dark green glaze that breaks with a metallic sheen of lighter green. This glaze fires to a gloss finish. 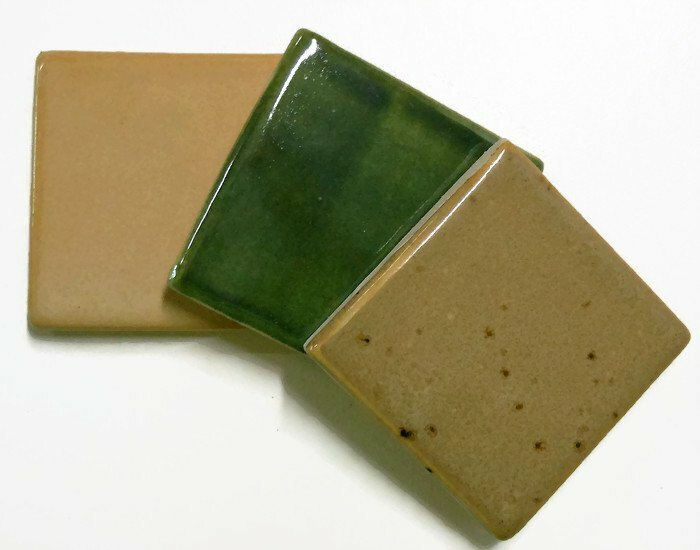 A highly variegated glaze that has multiple greens, soft blues, browns and tan colors. Fires to a matte finish. A beautiful gray blue that fires to a glossy finish. A soft medium blue glaze that fires to a glossy finish. A warm brown undertone with a denim blue that floats on top. A brilliant blue glaze that can break a leafy green where glaze is thin. A brilliant, dark blue glaze. A great glaze for high relief tile and fires to a glossy finish. A satin finish glaze that is subtly variegated with a taupe to dark gray. Glaze varies from a light minty green to almost a greenish gray. This glaze fires to a matte finish.